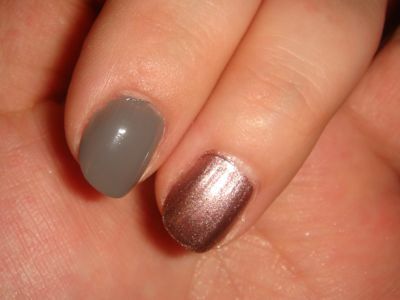 Sophsterlicious • UK Blog: Accessorize Cosmetics : Nails. Recently I got some Accessorize goodies to try out, and I wanted to talk about the nail polishes that I got. Magical Mocha is a brown shade that changes colour in different lights to a burgundy colour. It has a metallic finish and looks absolutely gorgeous on. I wore it out over the weekend and I could not stop looking at my nails! That's always a sign of a gorgeous colour. Truffle is just a greige-ish colour really, more on the grey side. It's a cream finish and is opaque with just one coat, which is impressive! The Mocha needed two coats. Both polishes dry in reasonable time (less that five minutes) and they last really well, I've had the mocha shade on for four days and it's only just chipping slightly. I also have a Illusion polish in Gold Dust, which is just a clear polish packed with gold sparkle, and I mean packed! It looks great on top of coloured polish and one coat is enough to show lots of glitz on the nail! See what I mean? .. They are all really nice good quality polishes, and the best part is that they are only £4 each! Bargainous, eh? They can all be purchased in Accessorize, Superdrug, or Online.